Striker Jake Bastin is now in Milan with his father Steve, a former famous footballer, who is designated commentator at a Four Nation Tournament organised to raise funds for humanitarian aid in Africa. Jake has learnt a lot about his father during their time in Russia. He is shocked but satisfied at what surfaced about his father’s real identity. The truth cleared away the fog of doubt, suspicion and disillusion that had tortured him for so long. He learned that Steve has been living a double life while working for years for MI6. At the airport, while Steve is taken away by two officials, his mother Hayley, a former model turned professional photographer, is attacked while clicking away randomly at passers-by and her camera stolen. Jake gives chase, is bashed, but ultimately manages to retrieve the broken camera which unknown to him, has captured valuable evidence. This opening action sets up the tension and suspense and wins the focus of the reader. At the stadium, a large protest has been organised against anyone involved in Granble Diamonds, a powerful mining company considered illegal because of their trading in blood diamonds which uses child labour under inhumane conditions, and which has a record of countless deaths. A fashion parade is scheduled to highlight the 100 million dollars worth of Granble’s diamonds for the benefit of his investors. But anyone connected to that name is getting payback. Someone is murdering the models and Jake is in the middle of it for one reason or another. Now he too, is being hunted. He knows too much and his father’s advice to listen and report back is never enough for Jake who always dares to go further than he should. But when is far enough, too far? And why is his mother being targeted as well? This exciting new espionage series shoots off at the first page. There is never a boring moment. The stories support the underdog, and have a strong social voice behind all the action and suspense. It is aimed at a teenage audience of age 15+ (in my opinion). 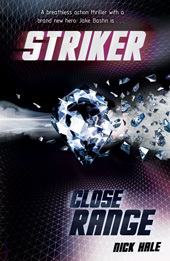 For fans of this new hero, the third book, Striker: The Edge, is due in February.